"The Crows" are not a unified political entity. references to "The Crows" having an agenda or position on a matter are at best ambiguous, at worst meaningless. i hope the illyriadtimes will consider revising this point of style. It does mention that it is rumors and opinions. People should be informed that it is informational editorials. 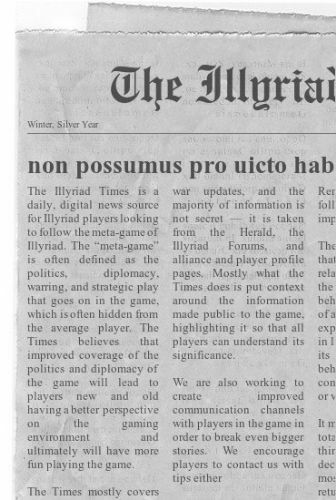 Compliments to the publishers of the illyriad times. In general, I find the articles very entertaining to read and the sites layout looks good as well. It must take quite some effort to publish new things each day. I hope you can keep that up. Totally agree! Its fun reading ... slight errors here and there but that's to be expected. I think having it posted in a non-Illyriad blog, keeps it from being regulated by Illyriad, which at times can censor what is written. Even if the blog degenerates to poking people to anger.. Illyriad Times it is not their realm of control and censorship. Neither is it a reliable source of facts, since it generally reports only those that are seen as positive or supported by one side. The comments section is also heavily moderated to only reflect the views of the authors. It is a propaganda piece published by one side. As long as one understands that and reads it primarily for amusement rather than information, then it is indeed an interesting addition to the Illyriad metagame.